In case you didn’t know; step one (after dismounting the wheel) is to remove the remaining calcium chloride solution from the tires and save it... a $15 fluid transfer pump works fine for this... Calcium chloride solution is annoying and surprisingly expensive to make, so reuse is key. 18 gallon Rubbermaid totes are the bomb! 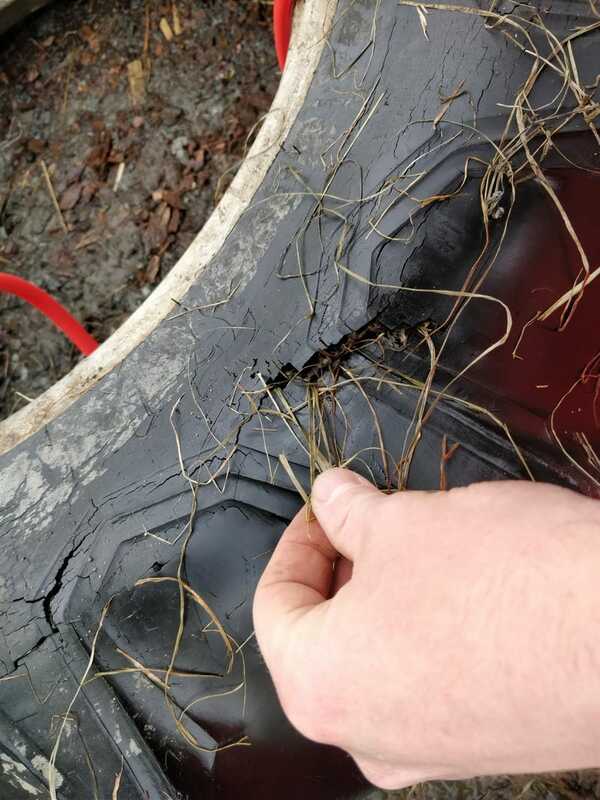 I was able to rescue just over 30 gallons of ballast, which is about how much a tire this size should have, i believe the original tires were somewhat over-loaded. calcium chloride solution is 40% heavier than plain water... these totes contain nearly 200lbs each! lookit that bulge! patience and a lot of pry-walking with multiple bars and it eventually comes off... pull off the old inner tube and get that busted old tire off the rim entirely. now’s a perfect time to clean up the rust on the inside of the rim. then it’s back to the pry-bars for the other side... oh yeah, stuff the new tube in before doing this step... forgot to take a picture of it. a very well deserved beer.